• Go to the web site fsaid.ed.gov and apply for a FSA ID. You will need to keep your FSA ID for future reference..
• Go to the web site www.fafsa.gov and complete the Free Application for Federal Student Aid. The application will be evaluated by the Department of Education. Within 5-7 business days an electronic SAR (Student Aid Report) will be sent to you and the Financial Aid Office. • The Financial Aid Office will evaluate the SAR to determine if your application was selected for verification. If you have been selected for verification you will need to supply the Financial Aid Office with necessary documents such as copies of Federal tax returns, verification worksheets, etc. If your application has NOT been selected for verification we will determine if you are eligible for grants. We will notify you either way with a letter letting you know. YOU MUST APPLY EVERY YEAR (not every semester). 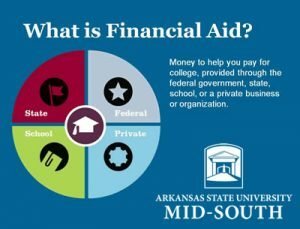 The financial aid year begins in the fall and ends in the summer. Typically you would apply after October 1 for the following fall semester. Why do I apply for financial aid every year? Financial aid is not automatically renewed. Federal requirements and/or your family’s financial situation may change. So you must reapply for aid each year. You should apply for Financial Aid every year even if you think you don’t qualify. Any change in family circumstances might affect your eligibility such as a brother/sister starting college. You may be eligible for monies that are funded by the state and federal government and do not have to be paid back. How long does it take to be notified if I am awarded? It really depends on the time of year. If you are submitting documents for fall in January, February or March, award information may be posted in April or May once all system upgrades have been put in place. If you are applying for aid when classes are already in session, the award information if usually posted within a week of submitting all your required documents. How will I be affected if I miss the Financial Aid deadline? Financial Aid deadlines are one of the most important things to consider when applying for financial aid. If you miss the deadline, this can result in classes being dropped for non-payment. At certain times, classes cannot be added back for any reason. Do I reapply for financial aid each year? You will need to renew your FAFSA form each year. The FAFSA application is available on January 1 each year. This will be a much easier process than before as 75% of the information is pre-printed. You will need to provide any new income/asset information. What documents/information will I need to fill out my FAFSA? • Your (and your spouse’s, if you are married) Federal Income Tax return (from the previous year) IRS Form 1040, 1040A, 1040EZ, Foreign Tax return, or Tax return for Puerto Rico, Gaum, American Samoa, the U.S. Virgin Islands, the Marshall Islands, the Federated States of Micronesia, or Palau. • Your current business and investment mortgage information, business and farm records, stock, bond, and other investment records. **Keep these records!! You may need them again. The parent with whom you lived with the most during the past year should complete the FAFSA. If you did not live with either parent or lived equally with each parent, the parent who provided you with the most financial support. It does not make a difference which parent claims you as a dependent for tax purposes. I don’t live with my parents, nor do they claim be as a tax exemption. Why am I not considered independent? The federal guidelines determine dependency status. When you complete the FAFSA, you will be asked specific questions which determine your dependency status. What eligibility requirements must I meet for Financial Aid? Academic progress for federal and state financial aid programs is based on three measures: Cumulative Grade Point Average, Pace of Progression based on credit hours completed compared to attempted, and a Maximum Time frame for degree completion. While the Satisfactory Academic Progress Policy is a minimum requirement to maintain financial aid eligibility, students are encouraged to work closely with academic advisors and college personnel to achieve their educational goals. Good financial planning includes selecting meaningful coursework, completing all registered classes with satisfactory grades, and seeking your degree in a timely manner. The following standards apply to the combined transfer/college cumulative GPA. Students must meet the following minimums which are consistent with the college’s standard as published in the college catalog. Quality hours are those credits used to compute the grade-point average including grades of A, B, C, D, or F and transfer credits with a grade of incomplete. The first attempt of a course that is repeated is excluded from the quality hour computation. Students must maintain a 2.0 cumulative GPA to receive federal and/or state student aid. All students are required to complete a minimum of 67% of all credit hours attempted. Courses with a grade of “D” or better count as completed. Credit hours attempted include audits, incompletes, withdrawals, and repeated or failed classes. Example: 30 overall hours attempted x 67% completion rate= at least 21 credit hours completed. The maximum time frame for the completion of an undergraduate degree is limited by federal regulations to 150% of the published length of the degree program. Most undergraduate programs at ASU Mid-South are 60 hours. The maximum number of hours during which a student is eligible to receive financial aid is 90. The 90 hours includes transfer hours and all attempted hours. Credit hours attempted include audits, incompletes, withdrawals, and repeated or failed classes. Up to 30 hours of required remedial/ developmental courses are excluded from the maximum time frame. Example: Degree requires 60 hours to complete, therefore the degree must be finished with no more than 90 hours attempted (60 X 1.5=90hours). Note: Those who failed the maximum timeframe standard will also need to submit a degree audit plan. GPA – is reviewed upon admission as a transfer or readmitted student, and annually at the end of each spring semester. Pace of Progression – is reviewed annually at the end of each spring semester. Time frame – is reviewed annually at the end of each spring semester. NOTE: Students enrolled in programs that are less than one year in length are reviewed at the end of the semester. SAP measurements can be reviewed more frequently if needed. Verification is a federally mandated review process. The Financial Aid Office is required to obtain and compare information submitted on tax documents, verification worksheet and the FAFSA. Students selected for verification must complete the verification worksheet and submit all required documents. Verification can be a lengthy process, therefore we strongly recommend that students and their families submit the form and all requsted documents as soon as they are requested. Any differences between information entered on the verification worksheet or other requestd documents and the FAFSA will result in a new determination of financial need. The new determination of financial need may alter the student’s financial aid eligibility. Students who are completing verification for the 2016-2017 academic year should submit copies of 2015 federal tax transcript. Beginning with the 2017-2018 academic year, the determination of student eligibilty for federal student aid will be based on prior, prior year income. Students selected for verification will be required to provide 2015 federal tax transcripts for the 2017-2018 academic year. These can be ordered online at www.irs.gov or by calling 1-800-908-9946. How much will I get paid for work study?